Actually, I'm curious as to why this wasn't already stickied. It's a pretty standard practice. Is the Main6 team trying to be contrary cool kids? Its because it's technically not an official thread; it's just a thread I made as soon as the forums were opened. Partially to make a worthwhile contribution to get my name out there early on, I will admit, but also to get to know some of the newer members better at the time. I suspected this thread would be a popular thread, as they normally are on all the other forums I've been on. As such, if a mod/admin wants to pin it to ensure new users see it, I have no qualms. But even if they dont, I suspect it will never fall too far off the map; new users will usually bump it up before that happens. Mostly this. We don't like forums with eleventy billion threads pinned that make you feel like you've got to read through before you can even begin posting, so we keep it to the essentials. Having so many work threads pinned in the backers section was more of a necessity than a choice, as those are basically the entire point of that one section for now. Well a hearty welcome to you then. Feel free to lounge around and browse the forums. You'll likely find something here ya like. Welcome! I just want to give ewe a heads up, there a puns here. Hello everyone! First time caller, late night poster. My name is Clawmaster. I am a Skullgirls player, streamer, and host of multiple online Skullgirls tournaments including Monday Night Blockbuster, Ultimate Show Stopper and Battlegrounds. It was sad to see how this game was shut down, but seeing the team at Mane 6 pull together to make the game still is pretty admirable. The Skullgirls Scene knows very well of your guys work, and I feel a good number of us in the scene also donated to this game. (Also its because its the same engine as Skullgirls too, ala Mike Z engine :^) ) I like what I see so far, and can't wait to see more come out in videos, and upcoming betas for the games. For the record, I plan to main Olander. Also I too am a brony. Hi! Welcome! Since you have a Squiggly avatar, you are by default a nice person. Welcome to the forums! We have puns, pineapples, and other general nonsense. Enjoy your stay. Welcome. Welcome to the house that Mane6 built. Yo. Only recently began following this game despite hearing about it a long time ago - boy was I missing out! I'd really like to get involved in the community of this awesome game. Hey hey! No shame in jumping in late. Any support helps, even if it only arrives on release day. And quite honestly, until that day comes, you'll likely find that you're in the more uncommon group here, as I swear these forums are 80% backers at this point. Anyways, hope ya like it here! And perhaps I'll see ya around at some point. I'm on the late train as well, but as Kirby said, no there's no shame in jumping in late. Just because you're late to the party doesn't mean you can't try to be the life of it. I hope you enjoy your stay at our cozy little madhouse. Welcome, welcome! Please don't mind the skeletons in the corner. We haven't had time to hire new cleaning staff. Hello as well. There is much here to whet your pallet, as I'm sure you saw. Be it talking about Thems Fightin' Herds, video games, forum games, forum RP, or whatever else, there is much to see and do. So welcome! What got you on the bandwagon? I mean, welcome. You may have arrived late, but it's still the same party over here! Hello my hoof comrades! Im from Russian TFH community! Name's sokolgs, or just sok. NOT "SOKOL GS" or "SOKOL", OK? I am an admin, working on TFH social group, Steam group and discord server (links in profile). Posting arts, news, making memes, drawing in Photoshop. I will post my work in other threads later. There's not much, but everyone says "damn, that's pretty good!" We are going to build crowdfund for winners awards. When TFH will be available im going to stream it on Twitch and YouTube all day long. I contacted with the biggest rus brony groups and 3 of them promissed that will repost us when the hype starts. Now i will be active in discord, and on forum. Looking forward to join this awesome international community! After the last Tournament, creator invited me to make next Tournaments! And now i am an admin, working on TFH social group, Steam group and discord server (links in profile). New person.... From north... You will not get a cold welcome here... I am tired and can't pun. Blame that. Weclome! I'm sure you've seen it already, but there are plenty of things to do and see here. And fresh meat new faces are always welcome! Hello and welcome to the little community we have here! I'm sure you'll fit right in! Also, I wanted to give you a far bit of warning, there are some non-believers on this forum here. Don't listen to those heretics. Arizona is and will forever be best ungulate. Well you haven't really missed anything yet. The game is still heading out of the presses, you can rewatch any of the past workstreams to catch up on what you missed. Also feel free to join any or all the Discord channels that are available to get in touch with the community members. Hey comrade sokolgs, I think we already herd each other on the Discord group. Welcome to the community. I didn't missed anything but crowdfund, so i sweared to "spread the word", and thats what i successfully doing. I realy want to get in the game as earlier as possible. Last time was said that Mane6 can help streamers/YouTubers with that. Does that include my situation? If i can't get that access, then anyways i will buy it as fast as i can. I'll be testing stream with my group and friends. Planned on 11 of March, 9AM PST, 21:00 (Moscow), right?. Come if you can, or watch later. I'll try to make it better then yours now, and i need your opinion, Neo). Will do. Maybe we can make a streaming community later on. Well, I heard about the game's predecessor a long time ago, but for some reason I wasn't really interested. But, the game being dead in the water as it was, the next step logical step for me was to look into Them's Fightin' Herds. I quickly proceeded to get hyped! It looks even better than it did before the legal stuff happened. Yeah I've actually been doing that haha (rewatching the work streams). Love seeing them talk about the development, and it also hypes me further because you can tell they take it all very seriously and know what they're doing. I was actually in the last stream they did as well, the one in February. They even answered one of my questions! Hi everyone, I'm Andre, a journalist working in Singapore. I draw in my spare time and I'm a huge fan of driving/racing games and Overwatch! I've been peeking in the forums and watching the work streams from time to time, but after I got the announcement that the Beta is coming in these next few weeks, I've finally signed up as a forum member yesterday! I'm ashamed to say I don't play much fighting games nor have I touched this one's earlier incarnation. But I was so won over by the rich lore and beautiful character design, as well as the fact that Lauren (whom I met in-person at Comic Con last year, she's so amazing!) is on board, that I knew I had to support this. I'm so excited by how Them's Fightin' Herds (as someone who has to come up with witty headlines for a living, I love the title!) is shaping up and how passionate the fanbase is even before its release! I was pretty late getting into the Brony fandom. I had only be part of it for a few months when I saw the campaign for Them's Fightin Herds, and I knew I had to back it. I have never learned how to play a fighting game, so I don't think I'll be too good. I'm just here for the cute characters, and Lauren Faust, for hanging out in the lobby, and especially to show some love for Mane 6. I want to start my introduction as a supporter of TFH off on a good note, I care deeply about all the hard work that was put into this project and have fallowed along since the early days. I am a fan of ponies as well, and a huge fan of Paleontology, I have a extensive knowledge of life in the past, and I currently work for a museum. I hope we can get along without misunderstandings. I've been really hyped for this game ever since the Fighting is Magic days, even though I wasn't able to back it at all since I'm from India, and I'm an early teenager, so... (Also our family doesn't have much money anyway...) But it's really awesome that even after Fighting is Magic shut shop, they came back as TFH and now it's at beta stage (of course, with the help of people like you )! It's been growing up so fast! Anyway, the new characters and lore have gotten me more interested in the game now. In fact, they're the main reason I'm here, since I've never played a fighting game before in my whole life; I'm usually after simulation games instead. Can't wait to see you around! Hi all! I'm Southpaw Hare. I've been around in other communities relating to both Fighting Games and Ponies. I play a bunch of fighting games, including Smash Bros, Street Fighter, Mahvel, Divekick, and Nidhogg. I also play Yomi, a card game made to simulate fighting games by SirlinGames, as well as historically have been a big part of that community. Finally, I'm also a game developer, and have done some hobby work on my own projects. A video about how Rock-Paper-Scissors is at the core of strategy in almost all games (co-produced with CloudCuckooCountry). A video showing a RTS/Fighting Game I was working on for some time. The rules for a fighting card game of my own design inspired by Yomi. A picture of my pony character, Wanderlust, who has an insatiable appetite for exploration (images drawn by an artist friend). I am a big believer in building a strong community when it comes to competitive games, and it seems as though ManeSix is as well. As such, I'm really excited to be a part of the community here and help in my own small way. Howdy there all! I've been a backer on IGG since day one, but just now getting started reading and posting in the official forums. I'm in the game industry, a level designer, mostly on mobile games so far. As a player my real passion has always been PC and console though- everything from obscure indie games to mainstream AAA titles. I'm terrible at fighting games, but am a fan of them, mostly from having a bunch of friends who are generally into the scene. I do wanna get into FGC more myself, so I'll start by earning my salt and getting bodied a whole bunch on here lol. Brony since the early days of FiM (2011), and Lauren Faust fan since even longer. 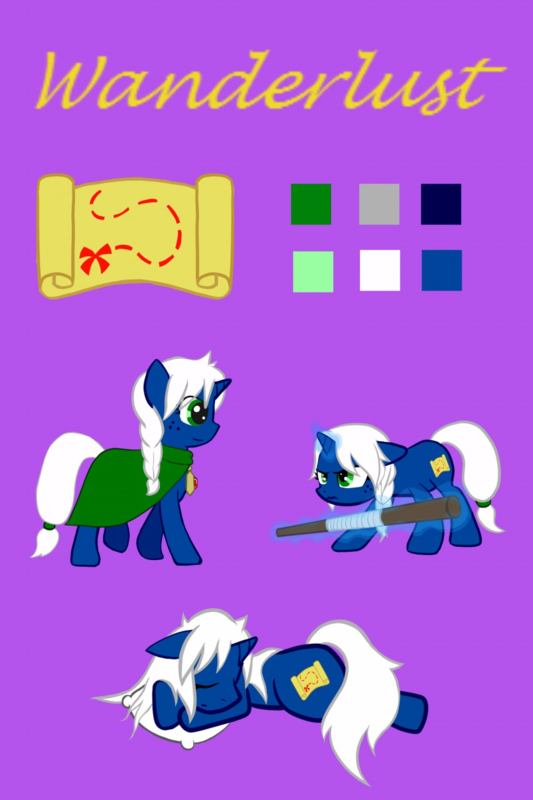 Favorite pony is BlueAwesomeFast and unsurprisingly, favorite TFH character is Tianhuo. I love how this game is basically the perfect intersection of things that I like, and I love how this original IP rose out of the initial project getting slapped with a C&D. If you see avatars running around the pixel lobby wearing salt shakers on their heads, that one was my idea; that was my backer item XD. Welcome to the forums! It's always great to have new people here and I'm sure you'll fit right into this amazing community.